The Holy Grail has been the national symbol of the Kingdom of Galicia for almost a millennium. The first time the Holy Grail appeared documented as the arms and banner of the kings of Galicia was in an English armorial dated from the 13th century. The way the Holy Grail is depicted as the national symbol of Galicia has been changing constantly over the past centuries. Originally, the Holy Grail appeared like protected into a glass box, and later the glass box disappeared. Also, the very first Grails appeared plain and alone in the flag with no crosses or stars around it. Later, during the 16th century, a variable number of crosses started to be added around the Grail for decorative purposes. The modern design of the Galician Coat of Arms was established in 1972 by the Royal Academy of Galicia, based on the most common designs of the Arms of Galicia found during the last century, on which the Holy Grail is surrounded by seven crosses. It was also the Royal Academy of Galicia which in the early 1980 asked the Galician Executive (Xunta de Galicia) to incorporate the former flag of the Kingdom of Galicia to the modern national flag. The result of that suggestion was the State Flag. The State Flag features the Galician Coat of Arms over the common civil flag, and is the the official flag that must be displayed in all institutional events of the national and local governments in Galicia. The Holy Grail (or chalice in which Christ's blood was collected after the crucifixion) appeared documented as the arms and banner of the kings of Galicia in the Segar Armorial, compiled in England circa 1282. This early representation features the arms of the kings of Galyce as three golden Grails over an azure field, organised in a similar manner as to the arms of the kings of Sweden. It must have been during the 14th century that the Galician arms changed from three to just one golden Grail; that is the way it appears on the Bergshammar Armorial (Sweden, 1436) or on the Gymnich Armorial (Flanders, 1445). In Galicia there still remains many Royal Grails carved on public buildings from the 15th and 16th centuries: the old Royal Hospital of Santiago (nowadays the Hostal Reyes Católicos), the Betanzos city hall, the fortress-walls of Corunna, the organ in the Cathedral of Lugo, the church of Noia, the manor house of the clan Moscoso in Laxe, etc... During the 15th century the field of the flag started to introduce decoration with varied icons such as angels or crosses. 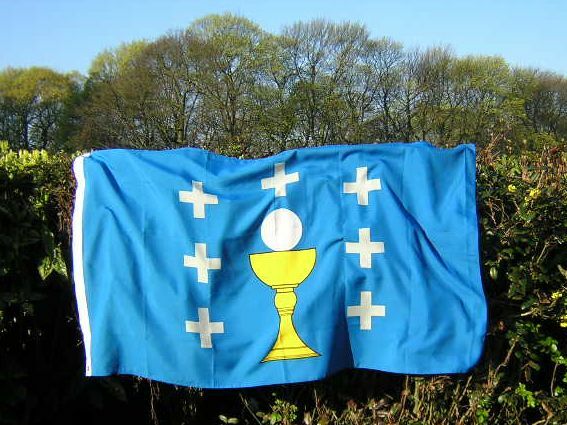 The crosses displayed around the Holy Grail were added to the flag from the 15th century as a simple way of decorating the empty space around the Grail. Originally, the number of crosses was 6 (three on each side of the Chalice) plus a seventh one over the Holy Grail. Those 6 crosses have sometimes been changed to stars (symbolising the 6 Galician Churches of Lugo, Iria, Britonia, Tui, Ourense and Astorga) or shells (Coat of Arms of Corunna). Some authors have suggested that the 7 crosses displayed in the flag may have been created to symbolise the 7 major cities of Galicia. That is incorrect. 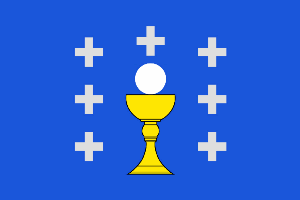 The historical evolution of the flag makes clear that the crosses were just born in a random number to decorate the empty space around the Grail. The official design of the Galician Coat of Arms was established in 1972 by the Royal Academy of Galicia, based on the most common designs of the Arms of Galicia found during the last century, on which the golden Holy Grail is surrounded by seven silver crosses over a blue field. It was also the Royal Academy of Galicia which in the early 1980 asked the Galician Executive (Xunta de Galicia) to incorporate the former flag of the Kingdom of Galicia to the modern national flag. The result of that suggestion was the State Flag. The State Flag features the Galician Coat of Arms over the common civil flag, and is the the official flag that must be displayed in all institutional events of the national and local governments in Galicia. Arthurian Myth: Tristan is taken in a boat to the kingom of the dead. Sculpture in the Cathedral of Santiago de Compostela, 12 Century. Legend has it that the Holy Grail was the cup used by Jesus to drink wine during the Last Supper, and that the very same cup was used later on to collect Christ's blood after the crucifixion. According to tradition, the Grail was taken by sea to the Atlantic lands of Europe, "where the world ends", and was eventually hidden in the island of Britannia. Medieval poets started composing tales of King Arthur's quest to find the Holy Grail and the story ended up becoming extremely popular across all the Celtic fringe of Europe. - As a Christian symbol, the Holy Grail contains the blood of Jesus Christ. The Grail is also related to a Galician legend which tells about a miracle happened in the Highland village of Cebreiro. Furthermore, the Grail is a reminder of the great importante that Arthurian literature and legends have always enjoyed in Galicia, starting from the Middle Ages right up until today. - As a Pagan symbol, the consecrated wafer dropping into the Chalice has been interpreted as the sun setting on the sea. The ancient Celts believed that the sun died everyday in the sea and was carried away on a boat to the Land's End, to the end of the world. For many centuries, it was believed that the end of the world was in Galicia, in Cape Finis-Terre, "where the earth finishes". Hence, the consecrated wafer is like the sun setting on the Atlantic for the ancient and modern celts of the Galician land's end.